This year, Raymond Pile celebrates 40 years of working with Greendale and the Carter family. Raymond is always busy, but we managed to persuade him to take five minutes’ break to tell us about his working life (and his fantastic collection of classic tractors!). Following the launch of Greendale’s partnership with Exeter College and their Apprenticeship programme we are delighted to share with you news of some early successes. 3 new retail units are available on a design & build basis to suit individual occupiers requirements. We are proud to announce Greendale Business Park have partnered with Exeter College to promote Apprenticeship Programmes here on the Business Park. On Tuesday 29th January. The Exeter College Apprenticeship Team will be visiting the park to hold informal chats with each tenant. about their requirements and give them some information on what they do. Businesses at Greendale Business Park once again welcomed students from Bicton College, who are currently studying for employ-ability qualifications. Come to Greendale Farm Shop on Wedneday 28th November, when we’ll be celebrating all things Christmas. 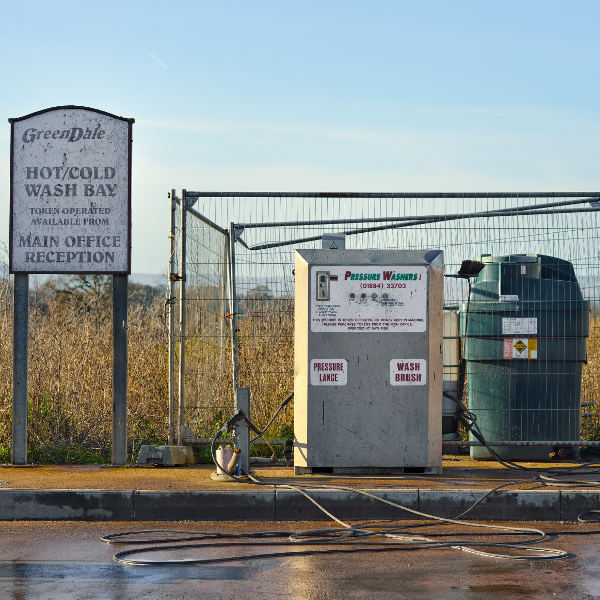 Greendale Business Park has a specialised vehicle wash, designed to clean all commercial vehicles. The facility is open 24/7 and is operated on a token system with credits available from the Estate Office. Greendale’s Annual Golf Day took place on the 27th September at Woodbury Park Golf Club. Participants included Greendale friends, colleagues, customers, suppliers and tenants, playing in individual Stableford and team competitions. Following their afternoon of golf, the participants retired to the clubhouse for food, drinks and the prize-giving ceremony. This October, South West holiday-home specialist EBCS Leisure will be exhibiting its 2019 range at Greendale Business Park. The event, which will feature brands such as Europa, Carnaby and Delta Caravans, will take place on October 4th (trade) and October 5th & 6th (public), and will be held at compound 11, Greendale Central Zone. As the evenings draw in and the mornings become a little crisper, make sure to warm yourselves up with a hot mug of coffee or tea from the Pit Stop Café. Following the public consultation back in July, we are pleased to report that Stagecoach’s service, Bus 56, has received a significant upgrade. The service, which runs between Exeter St Davids, the City Centre, Met Office, Science Park, Sky Park and Exeter Airport, before travelling onto Woodbury, The Greendale Business Park and then on to it’s final destination Exmouth, will start from 5am and run through to 11pm, with a bus every 30 minutes at peak times, which has been designed to fit more around key shift patterns and flight times. Click here to view the timetable. A planning application has now been submitted to East Devon District Council for a new footpath linking the A3052 to the business park in order to improve pedestrian access for the No. 9 bus service (Exeter/Sidmouth/Honiton). Our sister company, Greendale Farm Shop will be hosting another special food and drink tasting evening on Wednesday 18th July, from 5:00pm to 8:00pm. Stagecoach are proposing improvements to the 56 Bus Service which serves the business park, along with other routes serving the wider East of Exeter corridor. You can have your say as part of a public consultation which closes this Friday 13th July. Skybar is back for another year with two huge nights on Friday the 13th and Saturday the 14th of July 2018. SIGN UP TO GOOGLE MY BUSINESS - IT'S FREE! Attract new customers with your free Google listing. Your listing appears right when people are searching for your business or businesses like yours on Google Search or Maps. Google My Business makes it easy to create and update your listing—so you can stand out, and bring customers in. Greendale Haulage employs around 25 members of staff and operates ten walking floor trailers, two refrigerated articulated lorries, two bulk-tippers, two curtain-siders, one eight-wheel grab lorry, an articulated cattle lorry and two 3.5-ton vans. The haulage business operates across the whole of the UK. Representatives from Greendale, Devon County Council, East Devon District Council, Woodbury Parish Council & Woodbury Salterton Residents Association held a meeting in January to discuss planning & environmental health matters, business park operations and local residents concerns. Future meetings are to be held quarterly with the next one being due in March. A proposal to build a new footpath is to be submitted for planning to the council. It will link the A3052 to the business park and improve pedestrian access for the No. 9 bus service (Exeter/Sidmouth/Honiton).